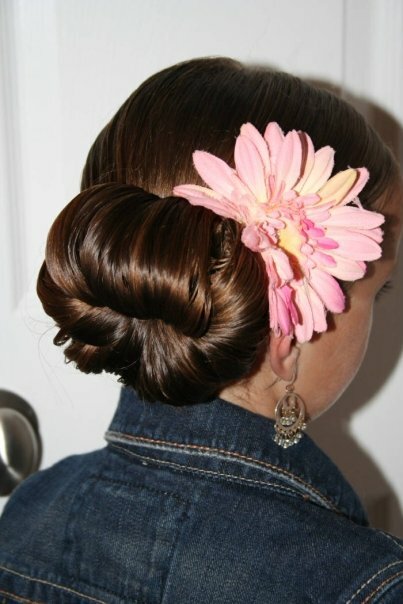 You can see that this bun is very elegant, and is perfect for Homecoming hairstyles, Prom hairstyles, for ballet, or any other fancy occasion. You may choose to accessorize it, or leave it as is. Now, as you watch the tutorial… notice how the roll-ups take on a somewhat “floral” look after they are bobby pinned. It is almost like the bun appears like a tropical flower whose petals are wrapping back. It is beautiful, isn’t it? As such, this hairdo would also be wonderful as a flower girl hairstyle. Time Requirement: Approximately 8-10 minutes. If you like this style, be sure to let us know! Happy Hairdoing!